I looked up local entrepreneur-turned Atlanta hero, celebrity, and savior (for startups and entrepreneurs, at least) David Cummings on his blog for any tidbits of sage advice. I searched for “features” and found a few, and really appreciated one particular post — “Consider Future Manual Labor When Adding New Features“. In essence, Cummings talked about realizing the ramifications of building new features, especially when considering the manual labor downstream. Pushing for features to go out the door quickly for testing is part and parcel to the Lean Startup process, but there must also be a careful consideration about the effects downstream as well. As we build Body Boss, we’ve come to realize there were a few features that were just wholly cumbersome to use, especially speaking with coaches. Each time we considered new features, or even existing ones, we have to take a careful look at whether or not we’re really addressing the problem in addition to if we’re just putting a bandaid. Because in the end, our customer-partners will tell us if they don’t like the new bandaid vis-a-vis complaints or low adoption. However, if our customer-partners continue to clamor for the better, simpler design or robust feature, it signals that it’s not that the feature is poor, it’s that the implementation is poor. Much like Cummings blogged about, as we build out features (you, too), careful consideration should be done to understand whether or not the actual implementation is just a bandaid or if it goes to actually building a better feature, and in these days especially, is the feature SIMPLE??? Simple not just for the users, but also for you the Company — the builders. Simplification leads to higher adoption. So going back to Coach Wooden, if you don’t build your features and your product right the first time (and you’ll know it), when will you have time? If you hear your customers clamoring for it, but they aren’t using it, chances are, you haven’t implemented it the right way. Look at it from your customers’ perspectives, and if you start struggling with the feature, chances are, too, that your customers have the same hang-ups. Let’s just hope that when opportunity comes knocking that you have the chance to still fix it the right way; else, your customers may just look for someone else that IS willing to do it the right way. What are your thoughts on building out a product or a new feature? Have you had trouble where you’ve built features, and haven’t seen it adopted despite customers wanting it? If so, how, and how did you remedy it? 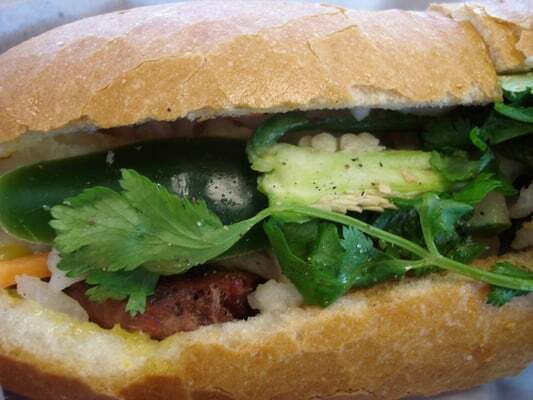 Today, I went to Lee’s Bakery for bánh mì sandwiches for lunch. It was crazy good. You should go get yourself the bbq pork bánh mì They also have chicken and other meats if that’s your deal. I was standing in line waiting to pay, and I was just watching the cashier ring people up, and watching the servers take orders scribbling on their little pads, frantically going back and forth between the tables and the kitchen. I was thinking about how technology has invaded so many parts of our lives where in so many other shops, you see business starting to adopt tablet-oriented point-of-sale (POS) systems. In all the English as a Secondary Language businesses (I’m dubbing them “E2L”), why is the rate of adoption so much lower compared to their English-dominant counterparts? POS systems such as those mobilized by Square or Stripe and apps like Shopkeep help small businesses by eliminating much of the hassles of the earlier cash registers including credit card processing, financial/ bank integration, transaction histories (taxes), etc. Many of the apps today that we see are catered to “us” — English-dominant businesses. However, business is a common language. Profits and losses are largely the same. The same pains of payment processing, training, etc. are ubiquitous business pains no matter the language. So you would figure (I do anyways) that you could potentially port over some of the great concepts that technology brings to small business from English-dominant businesses to E2Ls. Why aren’t E2Ls adopting? I liken this to how prevalent technology, apps, etc. are exploding here in the U.S., but not in some of the smaller countries. I have a friend who is porting successful business ideas from America and adapting to his native country with great effect. Perhaps what’s happening is that in the end, these E2Ls don’t have the apps catered to them like “we” do — English-dominant speakers. One of the most prevalent gaps between any two people is communication. If I think about businesses and the POS system apps today, they’re all in English. Step into some of the E2Ls on Buford Highway, for example, servers, bus boys, owners… they don’t speak English. If they’re to adopt a technology, they’re not going to adopt something in a different language. So perhaps one of the keys and ways to expand and empower these E2Ls is supporting them with multiple language packs. Couple these new apps with easy to use interfaces, and perhaps even some language support with someone like TripLingo, and you could, potentially, have a new POS that breaks barriers. E2Ls are supported like mafias in that in these mini-pockets of varying cultures, word-of-mouth is that much more profound. I’m Chinese, if you didn’t already know. I know that my parents love to hire Chinese contractors. My Greek friends love to help and buy from Greek vendors. My friend’s Jamaican parents love to support the local Jamaican contingent. So in the end, perhaps if you build something that really caters to a culture, a language, that because E2L owners support each other that they could be more apt to also adopt the technology. I don’t know these E2Ls very well, and these thoughts are largely off the cuff. However, I do believe there’s some real opportunities here to fill the void that is leaving behind the rest of the countries around the world, and in many ways, the mini-countries in our very backyards. Similar to speeches, you have to know your audience and adapt your speech to the listeners. In the case of E2Ls, no one is really speaking their technology language. My grandparents didn’t grow up with a lot of technology, but by setting up their new laptops with simple things like language packs and streamlining the computers, they can easily call me on Skype at 2AM. Like I said, I’m not a pro at this. It’s just a casual observation that I’d love to hear some feedback on. The same hurdles for new tech adoption remain, but currently apps won’t help these E2Ls adopt at all. Of course, not everything needs another layer of technology and there is the issue of just adding another complexity to selling — not just new tech, but potentially a language/ cultural barrier, too. So what are your thoughts? How would you market a POS system or even new technology to these E2Ls? Since I left business school at Emory University’s Goizueta Business School for my MBA, I’ve taken on the scary move of working full-time on the startup I co-founded with friends, Body Boss Fitness. In a couple months of full-time startup-ship without the funds to really pay me (or anyone) a salary yet, I got all scared, and dipped my feet back into consulting part-time. It’s been a few months doing this to put some money in my pocket, and I’ve taken on now two different consulting projects. All the while, I also push Body Boss including traveling for sales and marketing and writing up blog posts like I just did here at Starbucks in Brookhaven on a Sunday. I do enjoy supply chain consulting for sure… but I’m going to dip back out of consulting and give Body Boss my undivided attention for a long while. If I say it out loud and put it on a blog post, I’ll have to stick to my word, right? Well, all this experience has also brought out this strange affinity for writing my thoughts, and it’s about time that I write another article for my SC Ninja Skills blog. Reflecting on my previous life as a consultant (okay, some of my current, too) and my passion in weight lifting, I’ve seen a couple important take-aways that have been highly leverageable in both worlds. Change is hard. When you go to a gym for a few years consistently weekly, you see those who come and go, and those who stay true. It’s clear those who are “newbs”. They come in, sometimes work half-heartedly, and then either stick around and wonder they’re not seeing the gains they want or they just disappear as quickly as they arrived. In consulting, similarly, companies who are looking to change make a difficult decision to embark on change. However, it’s so easy for companies to lose sight of the goal and milestones to bring about sustainable change. Even if you’re seasoned in the gym, you need to change to keep improving. Companies who don’t embrace the necessity to change as the world evolves are likely to see growth become stagnant, and is most often the case, fade away. It’s so easy for companies to keep going about their business managing the day-to-day without thinking larger and more strategically. However, without change, it’s even easier to then let competition come in and take everything away (think Blackberry, Kodak, etc.). In the gym, if you’re doing the same routine over and over again, your body adjusts and you no longer see gains in your strength. It only takes six weeks before your body adapts. Bringing an outside perspective can help. As a consultant, this is almost the very reason we exist. Similar to the point above, it’s so easy for companies to be complacent and continue to operate just as they have over the last 40 years. However, bringing in fresh eyes from consultants, an outside hire, or otherwise, can easily give perspective from potentially competition, other industries, etc. In the gym, bringing a friend who is knowledgeable about working out can easily bring new routines, or even help spot when you’ve actually got poor form. Establishing goals helps you achieve greater. One of the first things you do as a trainer with a client is to run an assessment. This includes understanding a baseline or where a client is, and where the client wants to go (i.e. lose weight, add 25 lbs to her squat, drop your 40 time by a half-second). Without knowing where you want to go, it’s hard to really push yourself and make it timely. In the consulting world, if you don’t establish a baseline of “current state” and plan for a “future state” (Shangri-la), how do you know what to do, who to employ, how your customers will react (if any)? Post-workout is just as important as in-workout. In working out, it’s important to take care of your body after a workout. That may include a post-workout protein shake to ensure you have the nutrients for recovery, or just daily nutrition in meals. If you aren’t eating right and stretching and the like, it’s hard to sustain any gains you may have from a workout. In consulting, implementing post-transformation catches is key to sustaining the change. Tracking efforts via metrics is one way of ensuring change has sustainability; while establishing a culture embracing change is another sure-fire way of keeping the momentum going. So what do you think about the parallels in working out and in consulting or even business in general? How would you use the lessons learned in the weight room in consulting, or vice versa?